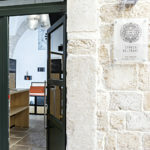 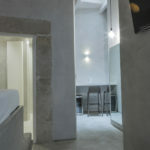 Located on the first floor of the nineteenth-century BORGOBELTRANI facility, the room boasts a wonderful open-air light well, from which it is possible to admire a completely stone-made wall restored in every smallest detail, on which has been highlighted the architrave of an ancient completely stone-made door which connected the building to another one. 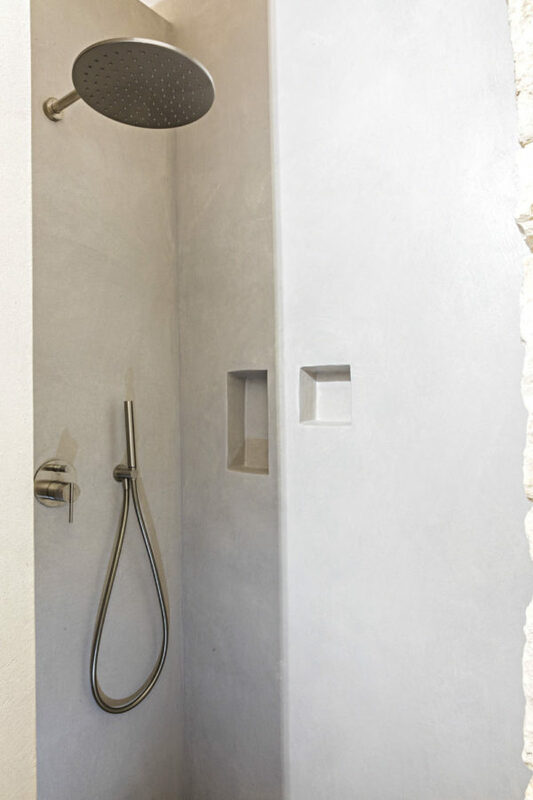 In particular, to admire in the room is an architrave recovered despite its centuries-old yields, used as the entrance of the splendid bathroom entirely made of resin. Located on the first floor of the nineteenth-century BORGOBELTRANI facility, the RE MANFREDI room takes its name from the splendid medieval castle where lodged, indeed, KING MANFREDI. 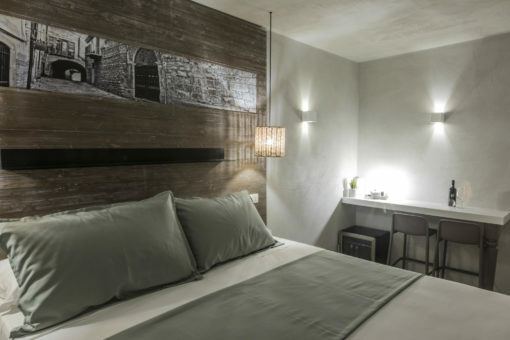 On the wall of the room can be admired a black and white picture of a detail of the splendid castle. 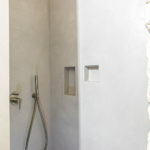 To be noted, on a bathroom wall, is a small fragment of the 1800 stone wall left in view. 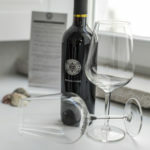 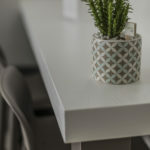 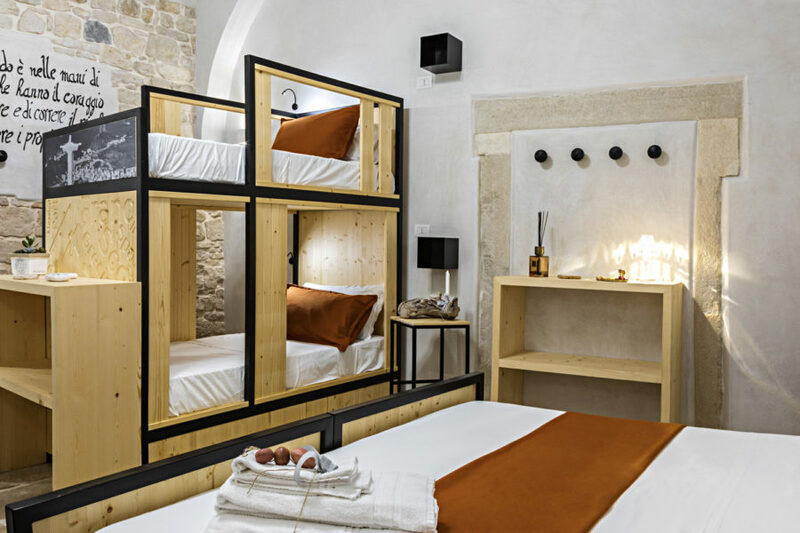 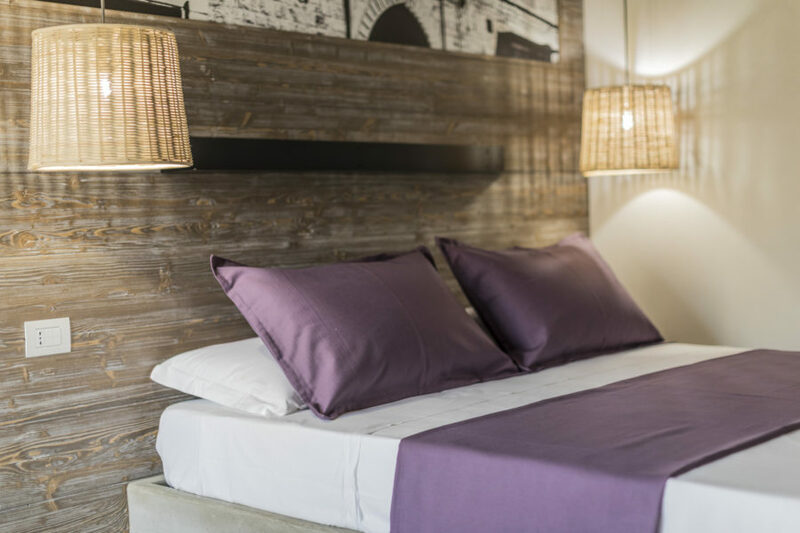 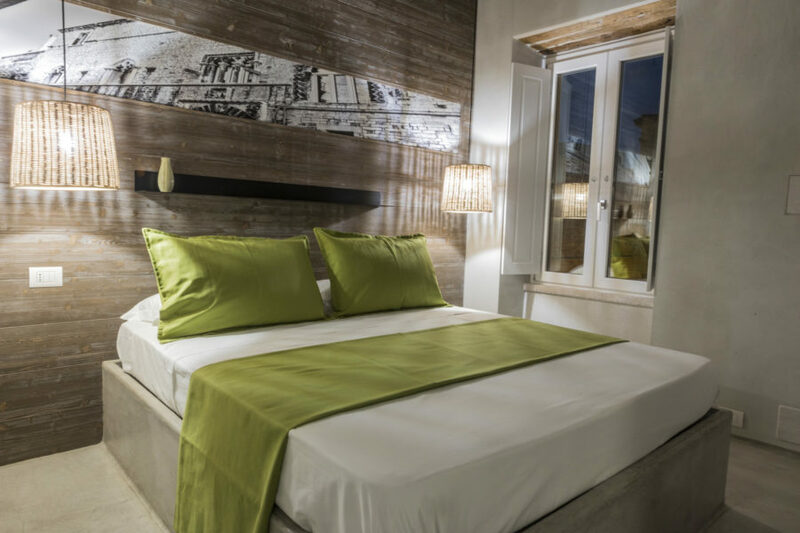 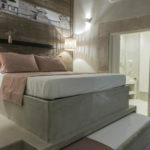 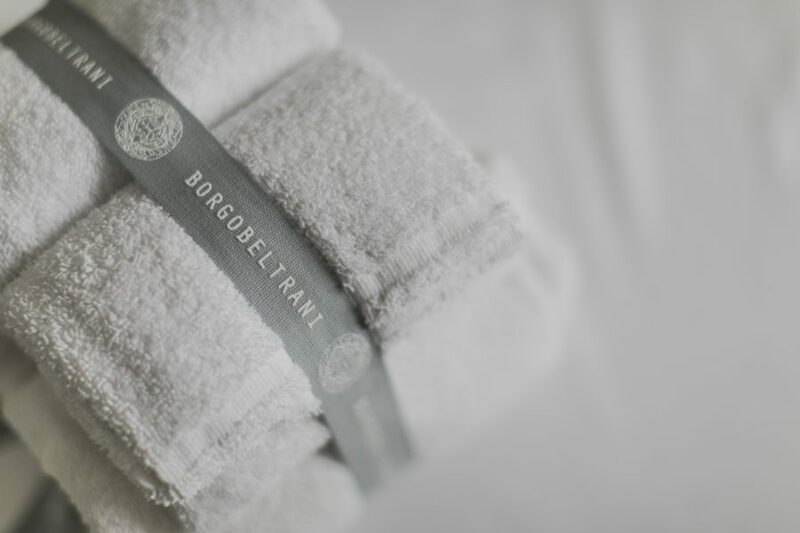 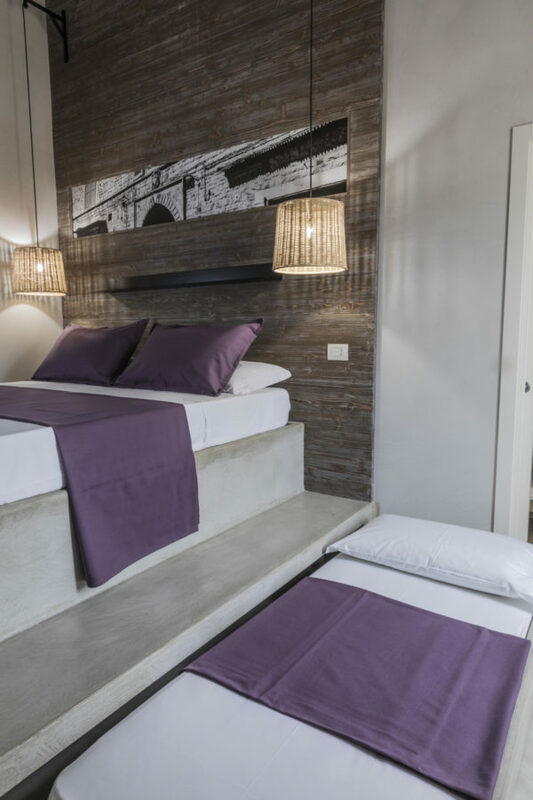 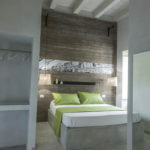 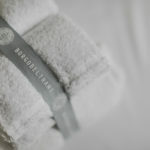 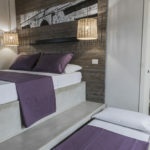 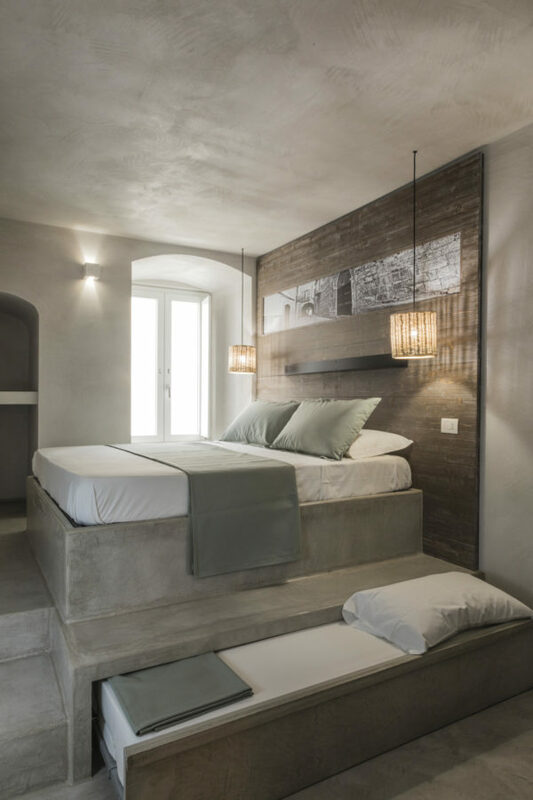 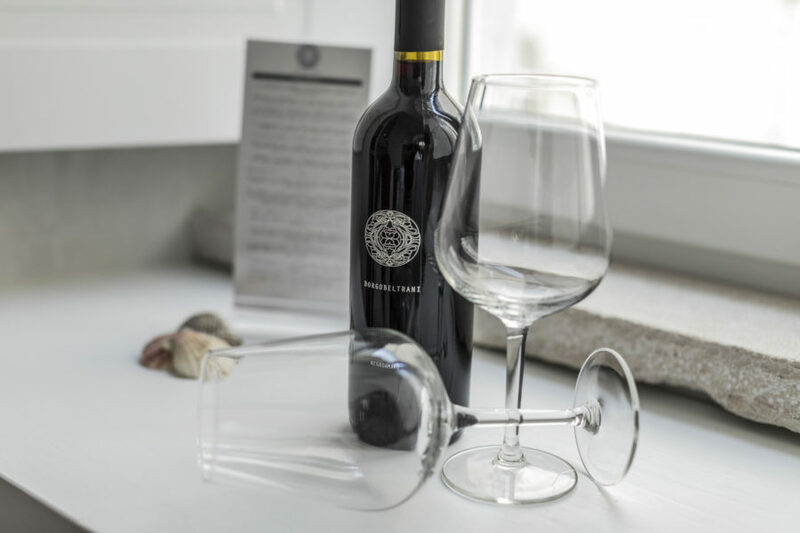 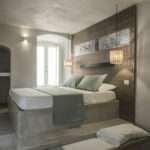 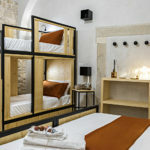 Located on the first floor of the nineteenth-century BORGOBELTRANI facility, it is the only room that boasts a splendid balcony that characterizes the atmosphere of a medieval village, making the overnight stay more unique and intimate. Having an angular exposure, the room also boasts a splendid window and handkerchief vaults typical of the nineteenth-century construction period. 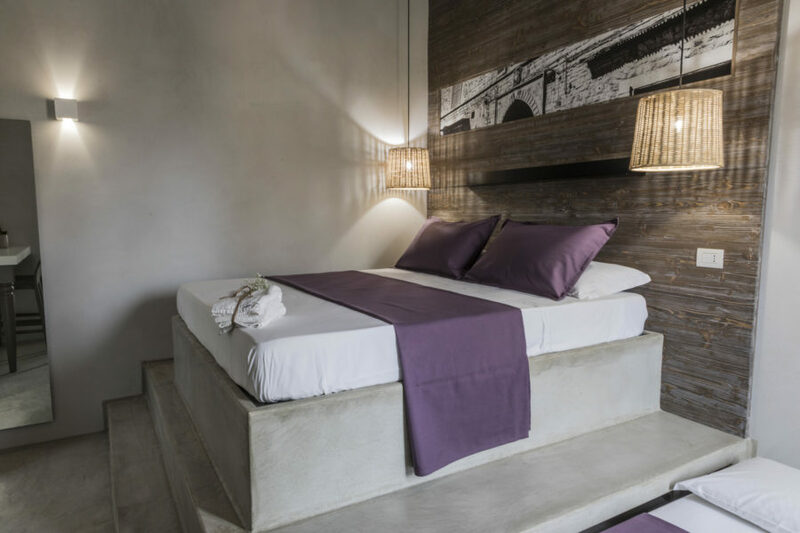 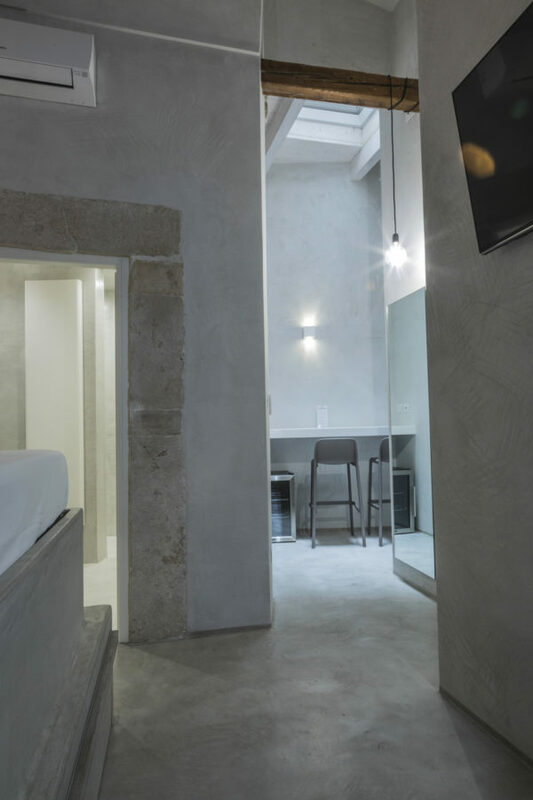 Located on the second floor of the nineteenth-century BORGOBELTRANI facility, the room is characterized by its ancient niches used as clothes hanging spaces. 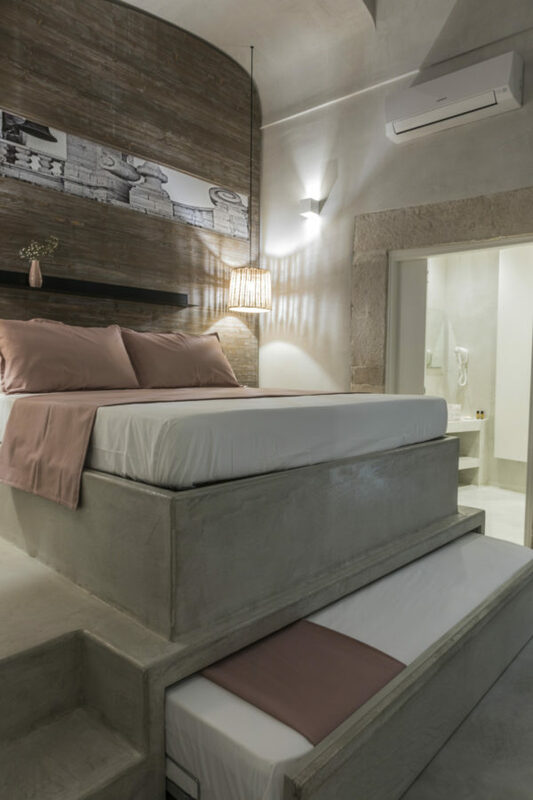 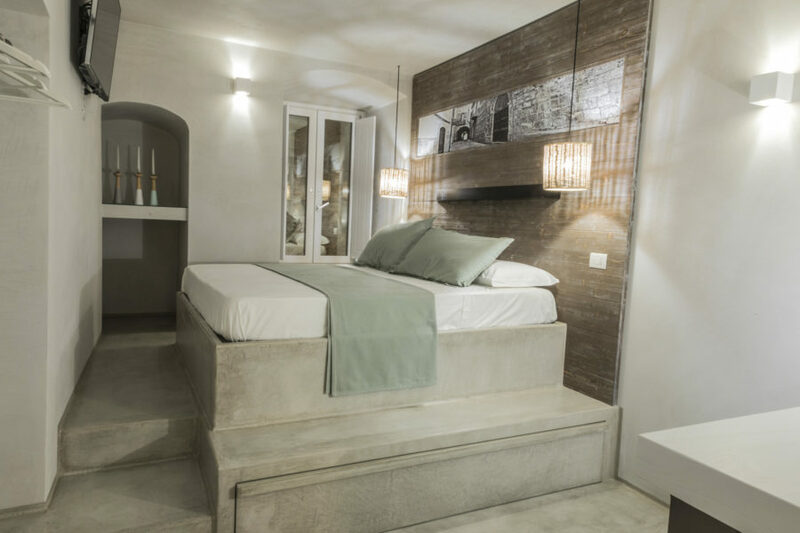 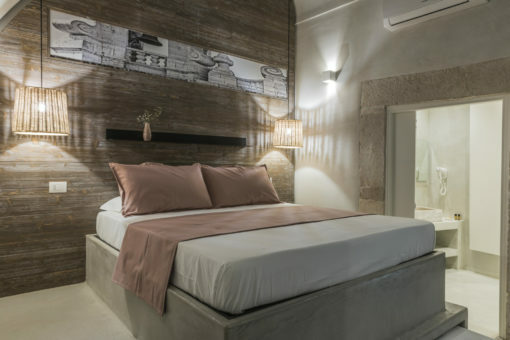 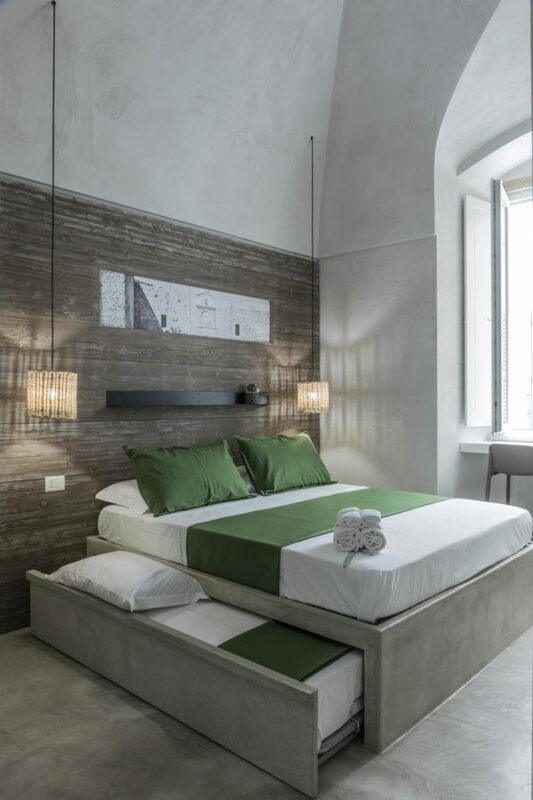 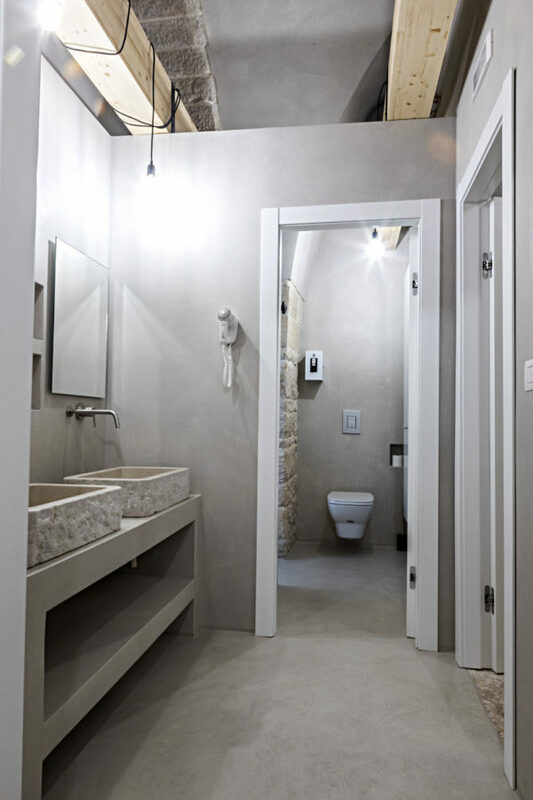 It is the only room with a corridor that, used to reach the comfortable bathroom, directly overlooks a light well of the building from where you have the opportunity to appreciate a completely stone-made wall recovered and restored by specialized workers. 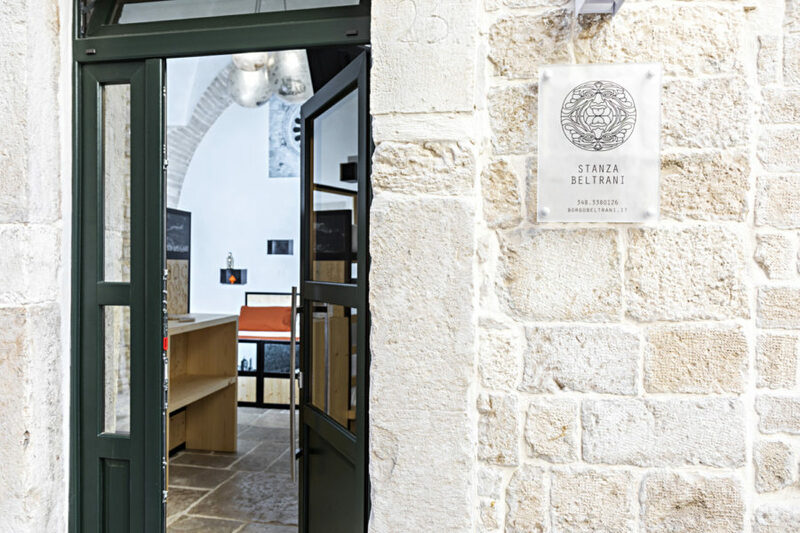 Located on the second floor of the nineteenth-century BORGOBELTRANI facility, by reaching it there is the opportunity to appreciate the entire stone staircase recovered with a meticulous restoration and enhanced by light spots. 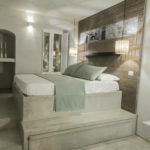 Entering the room, peculiar for its 5 meter high vaults and the beams left in view, it is very bright thanks to its angular exposure. 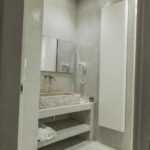 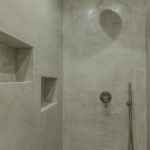 It also boasts a large bathroom made entirely of resin and characterized by a maxi-sized shower. 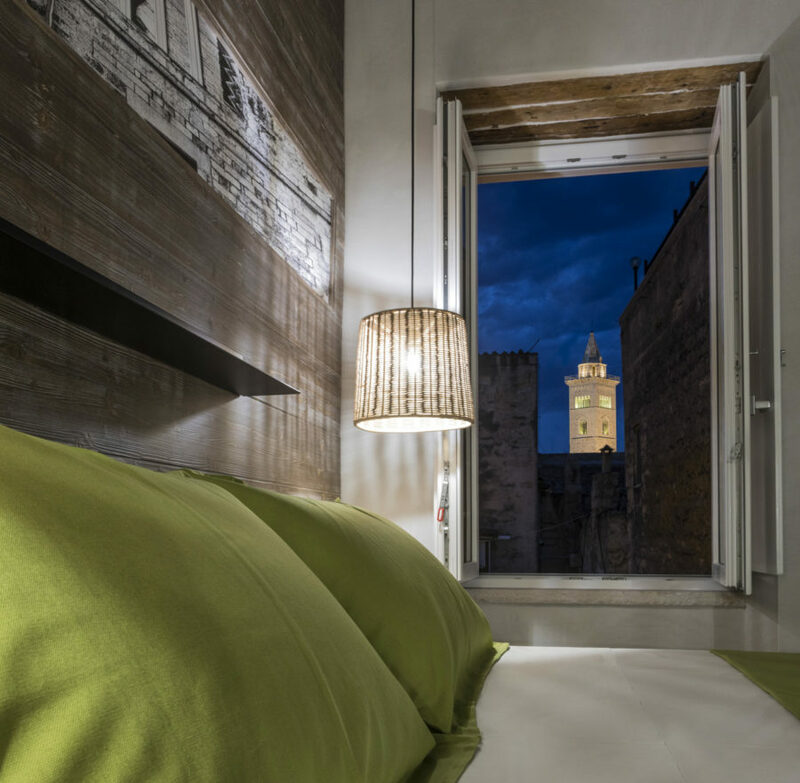 Located on the second floor of the nineteenth-century BORGOBELTRANI facility, the OGNISSANTI room is the only quadruple that will give you the chance to admire an expanse of the cathedral bell tower which, majestic and elegant, pokes out from among the terraces. 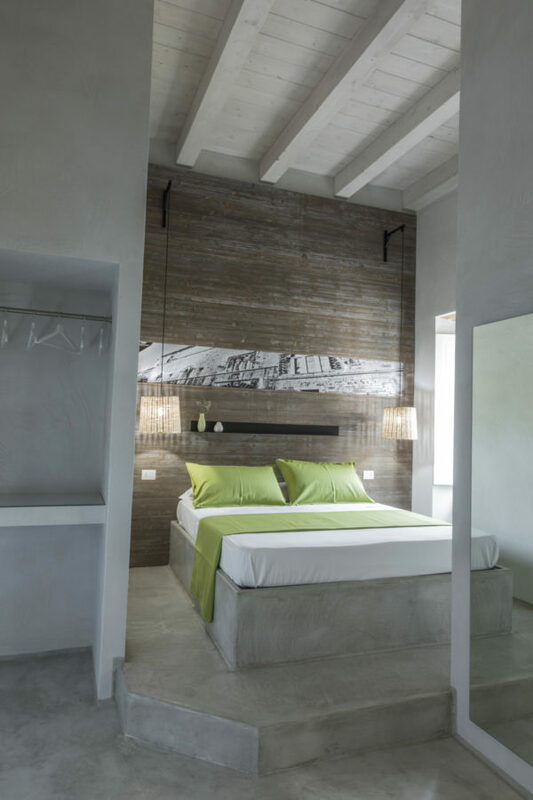 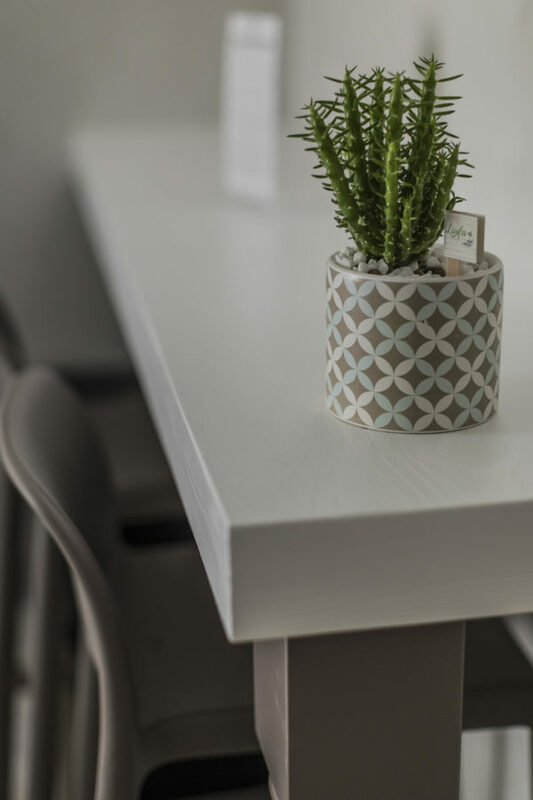 Brightness, spaciousness and refinement are the characteristics of this wonderful room. 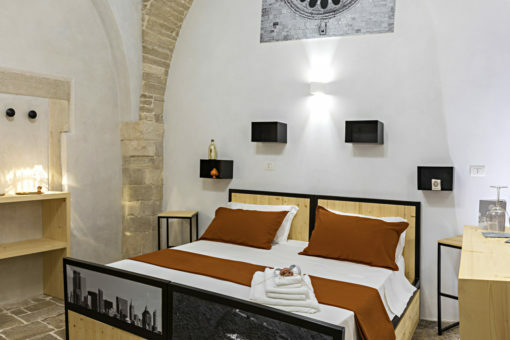 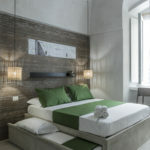 The room is finely renovated and keeps its original vaults, walls and stone floor. The room is in a noble palace built in 1700, it is rightly located on the ground floor for those who wish to recall in the present time the memories of the past colours and scents. 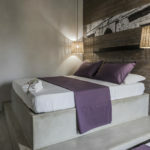 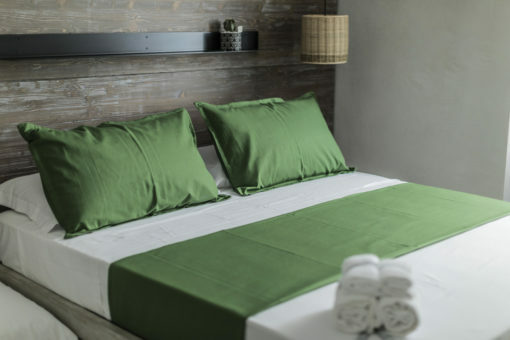 – 1 “maxi” double bed. 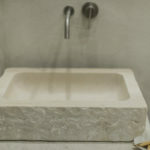 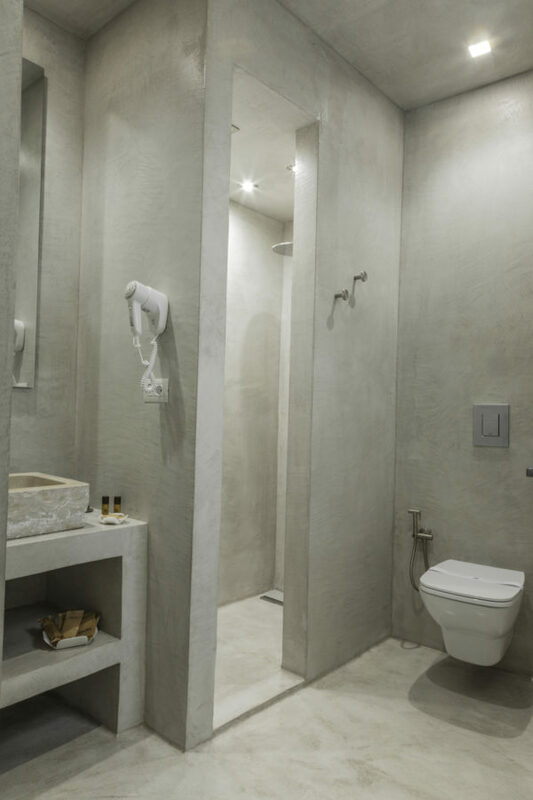 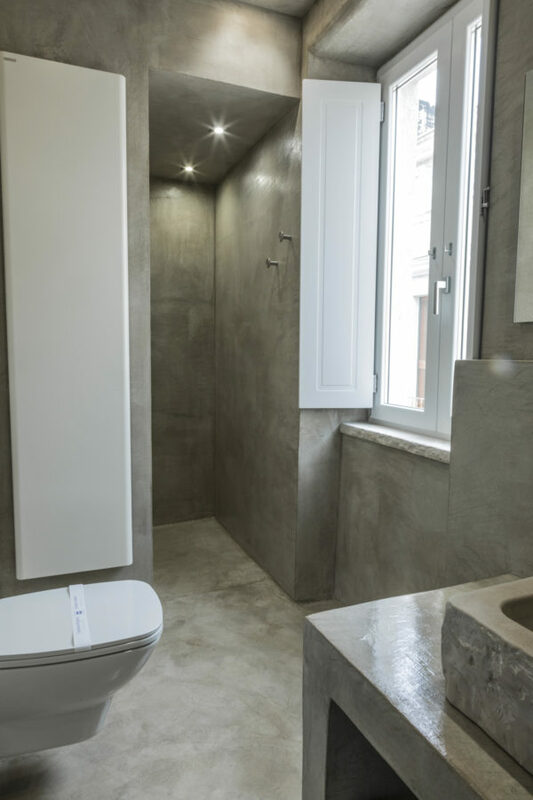 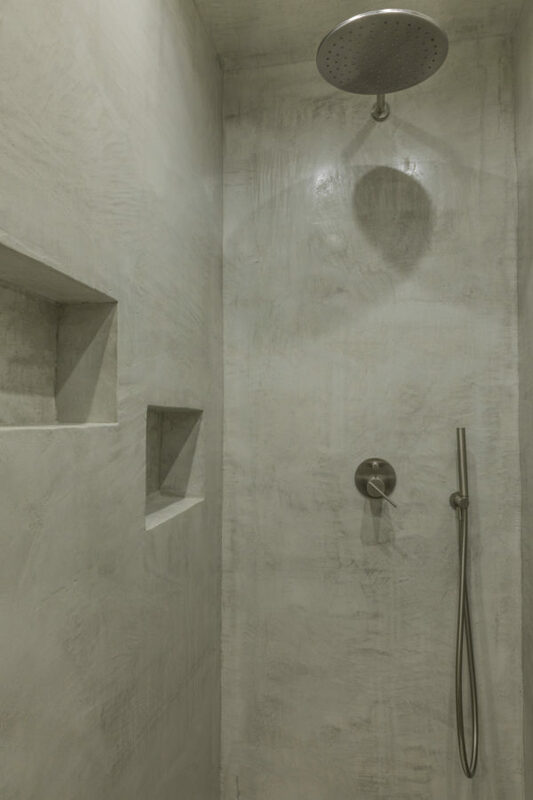 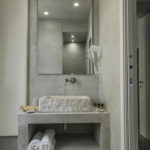 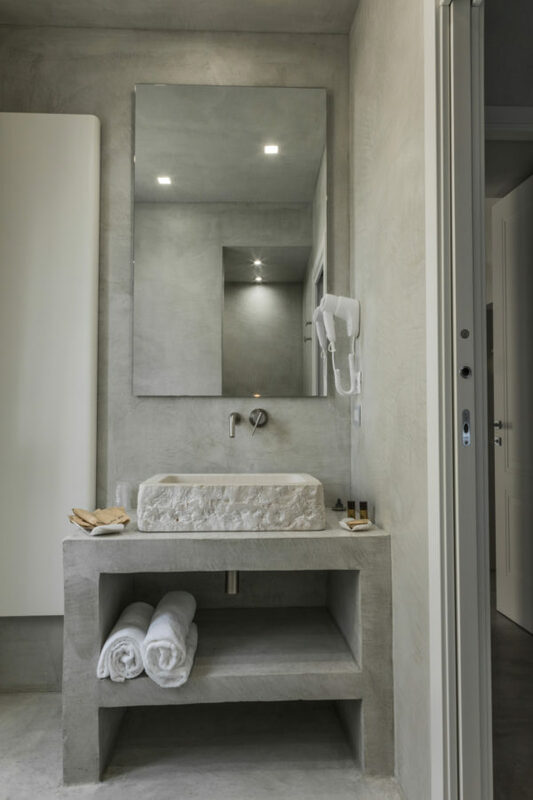 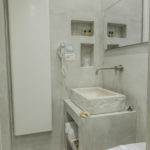 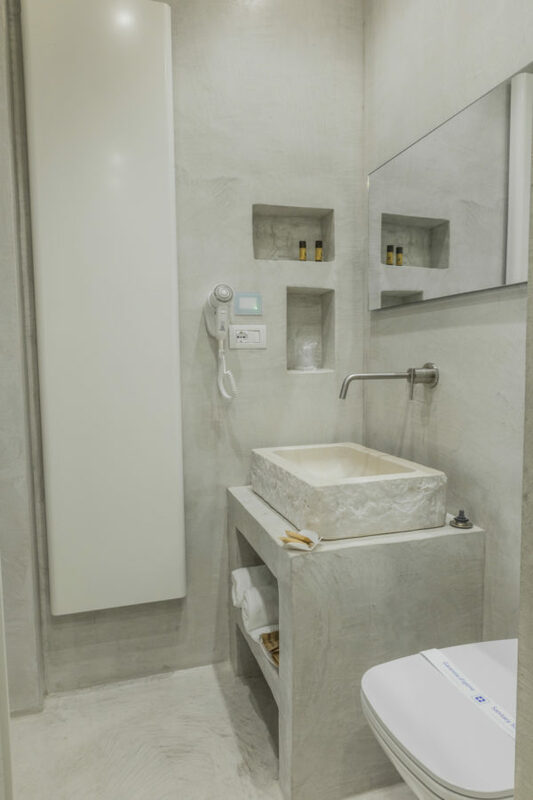 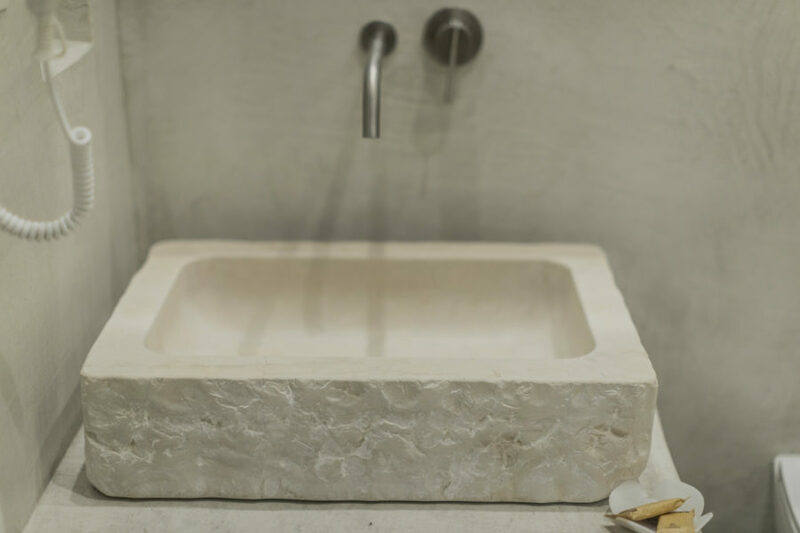 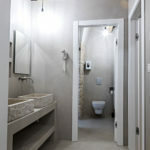 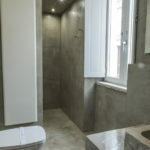 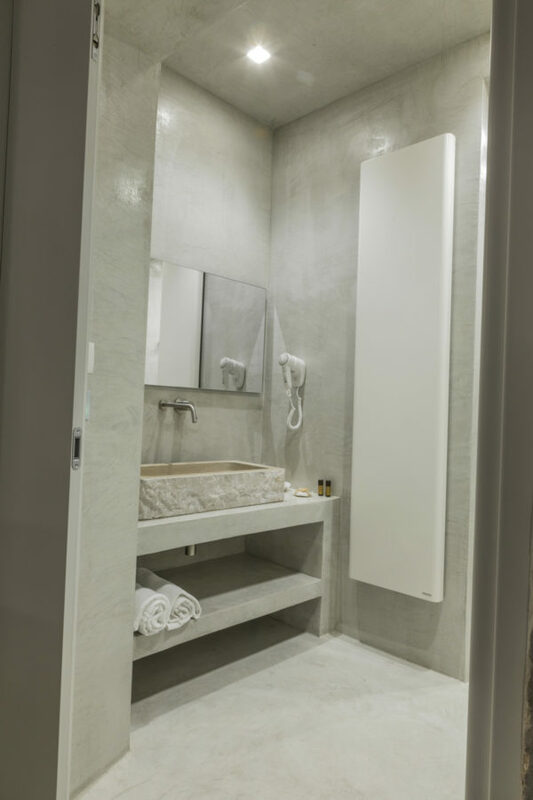 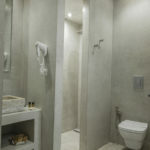 The bathroom has an ante bathroom with two Trani stone washbasins where some light effects, wooden architraves and stone columns witness to the refined restoration.